"Sometimes you need luck as a director. We always think it's all about control and it is a lot about control when you direct a movie, but it's also about things that you can't foresee." 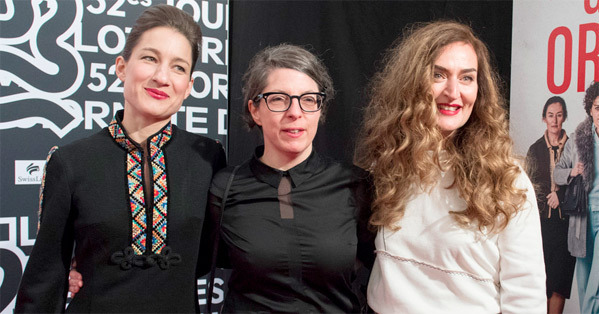 There's a film now playing in theaters titled The Divine Order, from Swiss writer/director Petra Volpe. The film is Switzerland's entry in the Oscars this year and it's obvious why when you see it. 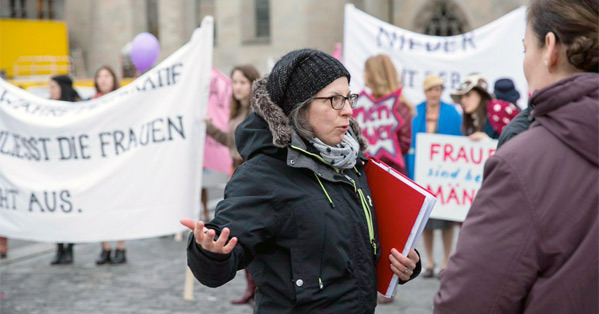 This very entertaining, exciting, engaging film tells the story of a woman in a mountain town in Switzerland who rallies other women to join in the fight for the right to vote. Swiss women only passed a law in 1971. 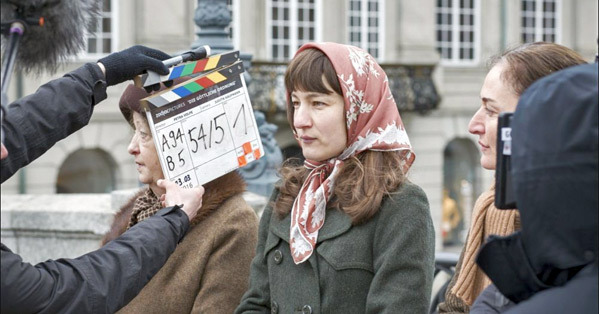 I had a chance to talk with writer & director Petra Volpe and I'm so happy I did - she's a joy to talk with and had much to say about making empowering films. 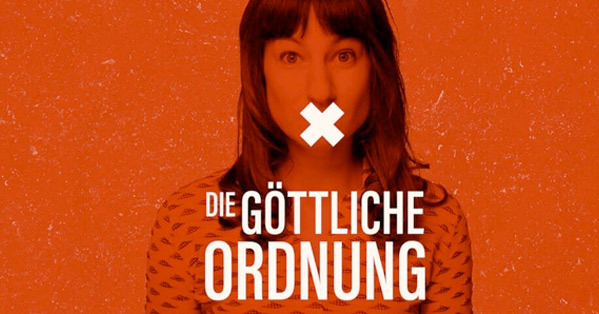 I highly recommend seeking out The Divine Order (originally titled Die Göttliche Ordnung in German) and watching it right away (US theater listings here). It's a remarkable film for many reasons, specifically for its balance between laugh-out-loud humor and headstrong inspiration, as well as for the lead performance by Marie Leuenberger. It also has some excellent cinematography and great music. It took me a little while to finally catch this film after first hearing about it, and as soon as I did, the first thing I wanted to do was tell everyone else about it because it was so damn good. Don't put it off! Just watch it as soon as you can. I laughed more watching this than most other films this year. And I'm so glad I could talk with Petra about it, I'm always happy to support and discuss some of the best films all year - even indie gems from Switzerland. Are you happy with the success of the film and the love it has received so far? Petra Volpe: Yes. I mean, who wouldn't be? Petra: What's been happening with this movie is really, I mean, really everything I wished for. Because it was a big box office success in Switzerland and that means a lot to me, because it meant that people went to see a movie that's really dear to my heart with a topic that's highly relevant. It's about equality and single courage and democracy. And it's great to make a political movie that actually brings people to the cinema. My whole team and my producers and my actors, we are so thrilled about this – that the people really love the movie and that festivals love the movie. You make movies for the people! So people go to the cinema and so far the reception of the movie was so great, and people reacted so emotionally and so graceful, especially in Switzerland. A lot of women were just so grateful that finally their story was told. That's just, that's great. And of course now that we are Switzerland's entry for the Oscar is like the cream on our cake. It's a fantastic film. I was laughing a lot and I wasn't expecting that. It balances the comedy and the seriousness very intelligently. Which came first in development? Was it written and conceived as a dramatic film and then you added comedy? Petra: For me, from the beginning it was clear that I wanted to have a film with a lot of humor. That was really my absolute first approach to it, because I took it from a very simple thing that happened. When you tell people that women in Switzerland got the right to vote in 1971, people usually laugh because it's so terrible. And I think that's a mechanism that also works with me. When things are actually really bad, it's really good to also laugh about them. And I think the best material for comedy are the biggest dramas. So I think drama and comedy are not a contradiction. On the contrary, if you want to write good comedy, and I don't think [this film is] a comedy in a classic sense, but if you want to write good humor, you actually need an existential conflict at the base of it. And that was very given in this movie. And then it's also — I think a movie needs contrast. And a movie is also seduction. So how do you seduce people to watch a movie about women's rights? It's not exactly a topic that usually people flock into the cinema to see… I also had a lot of inspiration from British comedy, which I love a lot. They do a really great job at talking about social issues with a humorous touch. So quite early on I knew that's the kind of tone I was going to look for. But of course it's a lot of work. I didn't get there immediately. The balance of humor and drama, it never stopped that we had to work on this. It started with the screenplay, it went on when I was staging the movie. And into the editing process, the music process, how funny can it be? Let's balance everything out – that was really a lot of work and also an epic challenge. How did you cast Marie Leuenberger and why her? What was it that made her the perfect choice? What did you see in her that made you feel she is a perfect Nora? Petra: Well, she surprised me when we did the casting. She did the most surprising things at the casting. She had a very bold interpretation, and I love when actors surprise me. But for me she has this perfect mixture – I needed an actress who really can go on that journey, who can do that development from shy and withdrawn and a little bit submissive, but doing her thing, being completely a daughter of her time, to become "the rebel." She needed some kind of tension within her that wasn't too obvious, because I didn't want a victim in the beginning of the movie. I didn't want to show a woman who feels she's a victim, who you feel sorry for. I wanted her to go on a journey to discover herself, how oppressed she is. And so she needed to bring a lot of unconscious, unhappiness. And her unhappiness couldn't be so out there. And Marie is a very, very subtle actress. So she has all the subtleties and the sensitivity but also the strength to give real dimension to this character. I think the role really changed her life, literally. I mean, she really gave herself. She gave herself completely to this movie and she carried the whole movie and she immersed herself into this world and together we studied how people moved in these times. We looked at a lot of archival footage and photographs, to find out the postures of people, how they would carry their handbags, what would they do with their hands and feet. Because people moved and talked really differently in the early '70s in Switzerland on the countryside. She tried to approach the character through the body. And she really went for that. It became a very intense process for her. I'm really asking because she's so good in it, just perfect, and so I was wondering how you went about finding someone who was this good. Petra: She's actually a gift from Heaven, really. I mean, the thing is, I cast another woman for this role but this woman got pregnant. And I was of course devastated. I was devastated, because I think she would have been a different Nora, this other actress, but also a Nora. It was shortly before we started shooting. And she calls me and says she's pregnant. And I had to recast. I have to tell you the truth – every day I was thanking the universe for this intervention. Yes! Because I think Marie turned out to be absolutely perfect. It was just such a pleasure and a discovery to work with her. And we were both saying that it was divine intervention. That she in the end got the role and that things turned out how they turned out. And sometimes you need luck as a director. We always think it's all about control and it is a lot about control when you direct a movie, but it's also about things that you can't foresee. That's often the beauty of our job. And then you have to be able to really grasp it and then you have to be grateful when stuff like that happens. A filmmaking question - what is your favorite part of being a filmmaker? Petra: Oh wow, that's a hard one, because I write also. I write and direct, so I think one of my favorite things is always in the very beginning of a project when you start to work on a project or you have a first idea and there's this excitement about it. And there's this innocence, because you know about this and you feel an urgency and you feel this little thing growing inside of you. And you feel this power and it's your little secret. And you can feel this story becoming in your head. I feel very much excitement when that happens, in the very beginning of the process. And then it's just many years of very, very hard work. Then you’re not alone anymore, everybody starts to have an opinion about it. You have to sell your little thing that's growing. You have to convince other people of it and it becomes a whole different process. And I really love writing. I think one of my favorite moments is really when the actors for the first time read the screenplay. When life comes to what you've written. When all of a sudden it becomes three dimensional – there are people and they're saying the things you wrote. And it becomes so much more than you've written because they fill it up with their interpretation and their bodies and voices. And that's a magical moment for me. When it jumps from the page into the physical space. When the story becomes physical, and sensual, because there's sound and movement and people. I think that's my favorite moment. What is your process? Do you start with a table read and then go through rehearsals? And do you prefer extensive rehearsal time or to just jump right into production? Petra: I usually try to get as much rehearsal time as possible. It's not always possible because it's expensive and people don't have time. But usually I meet with the actors and I talk a lot about the role, in general. About their ideas and their feelings about the character. I try to also put their feedback into the script. Because I think that's very valuable. There's not always the possibility to do a table read with everybody, but I try to rehearse. So we rehearse a lot of scenes. And that's really important, because when you're shooting it's a lot about physical direction. I think the hardest thing is to shoot things that have to look very every day and natural. This stuff is the hardest. To find a kind of rhythm and naturalness… Especially to rehearse the dialogue is important for me so the dialogue has the right pace and tone. That's very important for me. So I try to do it in rehearsal, I try to focus on dialogue and how things are said. And then when we shoot we can focus on the physical aspect of the scene. So every scene is a lot of work. It never just happens. And my DOP, my wonderful DOP, Judith Kaufmann, she also says every single shot is work, work and work. That's the great beauty of great filmmakers is that they make it look effortless and they also make it look seamless. And it turns into something that's so much more special thanks to all the work you put into it. Petra: Yeah. And that's the hardest thing. I think I find that very hard. Especially to stage something that's over the top I find easier than to stage something that has to look very natural and has to look as if people do it everyday. To get there with your actors very quickly – a scene in a kitchen, two people talking and doing something everyday. That's the hard stuff. What can moviegoers, regular people, how can we help support and what can we do to change the industry to support more female filmmakers? What can we do? Is it simply buying a ticket and speaking out about great films? Or is there more? Petra: Well, that's a very good start – go see movies made by women. And talk about them. And film journalists: write about movies women made, you know. Film journalism is also quite a male dominated area. In general, being supportive and being aware. And don't go to see only boys' movies. Don't support the studio system. The studio system which is so extremely, rampantly sexist. It's not amusing. Now it just comes to light for everybody because of Harvey Weinstein. But at the core of Harvey Weinstein is a deeply sexist movie industry, that it's so cracked. It's so crass if you look at the numbers. In the beginning of Hollywood there were a lot of women and they made hundreds of movies and there were more women in the movie business than there are now. You know? And it's a shame. As regular moviegoers, how can we help achieve change, you know? I just try to tell everyone about these great films and hope some go to see them. Petra: Yeah, the thing is it's not about men make not great movies, but the thing is women also make great movies. Petra: I think – to be aware of it and then continually have a choice. The most important thing is to really go see these movies to support them and buy the tickets. That's where you also have a power. As a consumer and a cinemagoer. What is your greatest hope with this film, what do you want it to achieve? What would be the greatest accomplishment for it? Do you hope it changes society or do you just want it to be the kind of entertainment that makes people think? Petra: It’s a bit naive to think that movies can change a society. But movies can raise awareness and that is always at the beginning of change. And I think the movie is really a pledge for single courage. It's a pledge for you as an individual in society, you can stand up and fight for equality and justice. That's something, and democracy is not a given. It's something we people have and create every day. It's not something that is just a gift and you can lean back and not go vote. People have been fighting, women have been fighting for the right to vote all over the world and there are people fighting to vote today. And we've gotten very lazy. And we take it for granted and we have to get our asses off the sofa and go to the ballot, you know. It's true. I'm very happy with the reactions to the film, because people are very moved and they feel fighty afterwards. They feel like yeah, right, we have to continue this and it was such a struggle and the struggle is not over and it's worth it, because the world is getting better for men and women when there's more equality. I agree. Completely. For one final question today: what films have you seen recently that have inspired you the most as a filmmaker? Or have impressed you the most. Petra: Okay. That's a hard one. And I don't see a really, really, really convincing film in a while. Petra: This year, I didn't go a lot to the cinema this year. You know why? Because I was always on the road with this movie. I think… a movie that my friend edited I thought was very strong. It's a documentary - it's called For Ahkeem. Ah yes, I know this film. Petra: I saw it at Berlinale. And I thought that was a very strong movie. Following this young black woman in her struggle to go to school. And I think that's the kind of movie that shifts our perspective and raises our awareness and makes our world, our little bubbled world, a bit bigger, to see people who have an entirely different struggle than I have and you have. And I really like that movie. I really liked it. I think they did a great job to show this girl's life. Yep. I saw it at Berlinale earlier as well. I really liked it, too. Petra: Yeah, Lily Henderson edited it. So that comes to my mind also because it's opening now in the cinemas and I really want people to go see it. Good. That's why I'm asking if there's anything you would recommend and hope people see. Petra: And I think Battle of the Sexes is worth seeing. Even though I'm not 100% convinced of the movie. But I think Emma Stone is really great and it's also a story of a woman who fought and was very brave. And it's also very empowering. I wish it had a little bit more focus. But overall I would say it's an important movie. We really need more movies about women and girls and their life experiences. It's really important. I agree, it left me in such a good mood. I was so happy by the end of it and it's rare now that I see a film that leaves me feeling so good by the end. Petra: Yeah. And also because of that tennis match is so great. Thank you to Petra for taking her time, as well as Hook Publicity for setting up the interview. Petra Volpe's The Divine Order (or Die Göttliche Ordnung) is already playing in select theaters around the US (see the official trailer). It has also already opened in cinemas worldwide, so check for it wherever you can and watch it as soon as you can. US theater listings here. Thank you for supporting superb filmmaking.